Little row boat on property for pond use only! My husband and I agree that the photos on here are a great injustice to the Cottage at Belle Knowle. Looking at the pictures, I got an outdated, small kind of feel. In reality, it's so much bigger than it looks in photos. It has much more of a rustic/antique/farmhouse interior than an outdated one. You don't get a good idea of the huge window in the TV room, overlooking the beautiful scenery (so beautiful that Erin even leaves you a pair of binoculars.) The pictures don't give you that "home" feeling, where you can walk in and immediately feel comfortable. That's exactly how this cottage is. Although I do have to admit that the photos make the cottage look more secluded than it is. It's actually behind the owners home, but in hindsight did not make a difference. We never saw anyone else and their home isn't visible from the deck/hot tub area. Erin has 4 shelves stuffed with books you could read. Cookbooks in the kitchen (she provides every pot, pan, tray, etc. you could need.) 6 completely full drawers of DVDs that you can choose from - all different genres. Board games and decks of cards. The TV has cable and wifi is also provided. She even has a speaker next to the hot tub that you can plug your phone into and play music. Overall, it was an absolutely wonderful experience. My husband and I agreed that we, without a doubt, would come back. Thank you Erin! The hot tub is the star of the cabin. If you are looking to stay in, and relax (nothing to do in town) you will love this place. Looking forward to returning in summer, to explore the land more. This Cottage was a beaut. It was super dreamy, quiet and away from all the noise of the big city. Everything us city folk wanted. From crunching ice snow mix beneath our feet and paws as we romped around, to soaking in the hot tub, to the kitchen that helped us fulfill our pasta, bread and croissant making from scratch. The cottage was the perfect amount of space for the 5 of us and our two dogs, had little nooks, warm beads, and beautiful skylights to let us watch the moon as we drifted to sleep. I see myself visiting this space again and again. Erin was an amazing host. Supper communicative, and responded quickly to any of our questions, prior to and during out stay. Thank you Thank you! Hope to adventure here again soon. Overall a very nice experience, with the hot-tub being the central amenity in the winter for our group of 4 friends who rented the cabin for a Feb. getaway. Reasonably priced for what you get. The natural surroundings were peaceful and lovely (multiple deer sightings). The cottage had a good deal of interesting character. The owner was very responsive and accommodating to a couple of issues that we had upon arrival. It was also very convenient to have a great market/grocery store literally just down the street. Some minor drawbacks that I wished I had known ahead of time: (1) the piano in the pictures is just an antique, completely out of tune and unusable, (2) there was no microwave, (3) the cabin is not quite as secluded and 'off in the woods' as the pictures make it appear (you can easily hear occasional road traffic not that far off), (4) the only way to reach one of the upstairs bedrooms is to go through another bedroom, (5) no washer/drier, so keep an eye on towel use with respect to the hot tub (maybe bring more of your own towels), (6) the cottage always felt a bit too hot or too cold during our winter stay, parts of the cabin are poorly insulated, and the layout of the house leads to a stark thermocline between the up and downstairs, (7) much of the house (i.e. appliances, furnishings, beds) are 'dated' giving the house a bit more of an antique'ie' feel than i was expecting, and (8) the outdoor gas grill (which we ended up not using) was in rough shape. Despite these drawbacks we really did enjoy our stay and I would likely consider booking again in the future. A wonderful and peaceful getaway. My wife and I booked this cottage for a long weekend to celebrate my birthday. 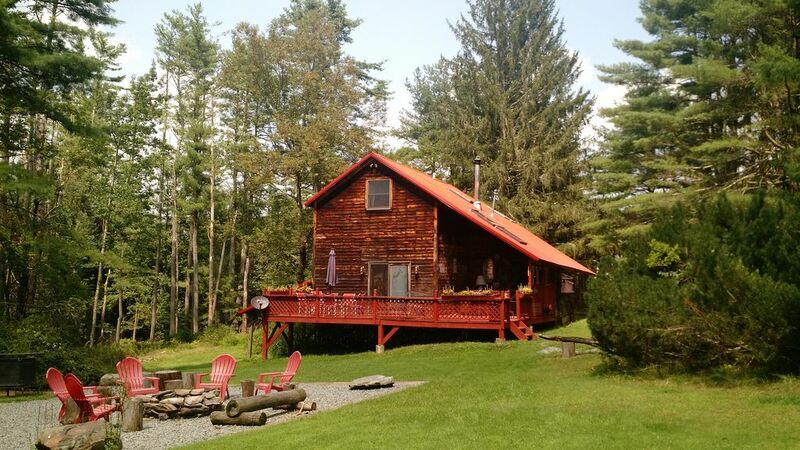 I've read in other reviews that the cottage is much larger than it appears in the photos, and they are correct! The cottage is very spacious, comfortable and feels like home away from home instantly. We had the privilege to meet Erin briefly and she's a very sweet and attentive host. Reading the directions to access the cabin and park are a little cryptic (even after examining Google maps) but make perfect sense once on the property. The location and town are straight from a Hallmark movie, probably not literally - but it could be! My wife and I were lucky enough to enjoy the open air but sheltered hot tub while watching the snow fall. So relaxing! We'll definitely return for more getaways in the future. My husband and I spent Christmas in the cottage and loved everything about it. Our favorite thing about the cottage was the hot tub. It's perfectly situated - two steps from the outside door into the bathroom, tucked in out of the wind and facing the woods for privacy. The kitchen is well appointed and the nearby grocery had everything you could need. Erin was an amazing host and extremely accommodating. She had the cottage decorated for Christmas - which made it so homey. We can't wait to plan our next trip to the cottage. This is Based on two people for one night also does not include the Cleaning and Maintenance Fee, pet fee or Tax.